September 8 — The Nativity of the Blessed Virgin Mary - Feast - My Catholic Life! The birth dates of great men and women are remembered for posterity. The presidents of the United States are commemorated near the February birthday of George Washington. Many nations celebrate their birthday on the date they gained their independence. The Church celebrates its birthday, so to speak, on the Feast of Pentecost. However, the Church typically commemorates its saints on their date of death, ordination, or other significant milestone. 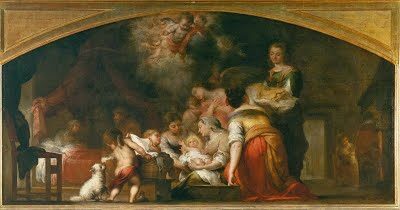 Only Christ Himself, Saint John the Baptist, and the Virgin Mary have feasts commemorating their births, because only they were holy from the start. They were sanctified by God in the womb, not made holy through grace and long trial during their earthly lives. Nowhere in Scripture is the place and date of birth of the Virgin Mary recorded. Nor are the names of her parents found in Scripture, although tradition tells us they were Joachim and Anne. It is not until the sixth century that there is sure knowledge of a liturgical commemoration of Mary’s birth. This is not unusual. Mary lived a largely hidden life, and her theological and historical significance remained veiled until the Council of Ephesus in 431 formally declared her the Mother of God. Since that definition, every aspect of her life has become the source of a rich spiritual and theological heritage. The Word of God, for the Catholic, is more than its written form. We are a people of the Word, not a people of the Book. Scripture is one expression of the Word made flesh, the Word spoken by the Father from all ages. This means that a richer, more layered meaning of the events of the New Testament perpetually unfolds in the Church. The written Word of God in the Bible is limited by the fixed nature of all written words. Once put on paper they don’t change. The Living Word is something more, and it is the Living Word that the Church teaches, preaches, and lives. Just like a person, the Body of Christ expresses itself through both formal language and through body language. The words of the Catechism, prayers, and magisterial documents use formal language. But the liturgy, sacraments, music, architecture, pious devotions, processions, etc… are more like body language. They communicate the same written truths in a different, more corporeal, more lived way. The silence of Mary, the hiddenness of so much of her life, is intriguing. It is an invitation to prayer and spiritual reflection. Her silence, and the silence of Scripture on so many events which must have occurred but are not referenced, means that there is, and will always be, more for the Church to reveal about Her greatest truths. It is not just Scripture that is inspired but the Church as well. She pulls from Her storehouse things old and new, polishes them off, and offers them to the faithful in culturally compelling language to deepen the content of faith and the faithful’s response to it. But even more than offering old things in new ways, even more than preserving past truths, the Church is a generator of revelation. She is the Living Word in the world of today, the vibrant Magisterium who absorbs the world’s questions and challenges in every age and gives them compelling answers. Tradition for the Church, then, is not just a jewel to be guarded. Tradition is forward looking, dynamic, and active. And this positive tradition continues to celebrate the birth of the Virgin Mary because it was she, the last great figure of the B.C. era, whose birth itself gave birth to a new world. No Mary. No Christ. Her birth was the start of the future we all now inhabit. Saint Mary, we celebrate your holy birth in the land your Son made holy. Your discreet life of prayer and service obscures so much, but speaks loudly as well. May our lives be discreet in their goodness, known to God and to those few who have the eyes to see and the ears to hear. Before the birth of Mary the world was lost in the darkness of sin. “Mary was born and the dawn arose,” says a holy Father. Of Mary it had already been said: Who is she that cometh forth as the morning rising? As the earth rejoices when the dawn appears, because it is the precursor of the sun, so also when Mary was born the whole world rejoiced, because she was the precursor of Jesus Christ, the Sun of Justice, who being made her Son, came to save us by His death; hence the Church sings, “Thy nativity, O Virgin Mother of God, announced joy to the whole world; for from thee arose the Sun of Justice, who has given us life eternal.” So that when Mary was born, our remedy, our consolation, and our salvation came into the world; for through Mary we received our Saviour. This child being, then, destined to become the Mother of the Eternal Word, God enriched her with so great grace, that in the first moment of her Immaculate Conception her sanctity exceeded that of all the saints and angels together, for she received grace of a higher order–one that corresponded to the dignity of Mother of God. O holy child! O full of grace! I, miserable sinner that I am, salute and adore thee. Thou art the beloved one, the delight of God; pity me, who on account of my sins have been hateful and abominable in His sight Thou, O most pure Virgin, knewest from thy very childhood so well how to gain the heart of God, that He never did and never will refuse thee anything, and grants thee all that thou askest. My hopes are therefore in thee; recommend me to thy Son, and I shall be saved. O my Queen, mediatress of sinners, perform thy office; intercede for me. My sins shall not prevent me from trusting in thee, O great Mother of God; no, I trust in thee; and so great is my confidence, that were my salvation in my own hands, I could place it in thine. O Mary, receive me under thy protection; for that is all my desire.